It was 4:42 a.m. when my alarm went off. And, no, it wasn’t my usual iPhone wake-up call. A pack of coyotes suddenly began yipping and howling, and it sounded like they were right under the bedroom window. I quickly got up to see if I could spot them. It was dark, but clear skies and snow cover allowed me to see shapes and shadows. They continued their eerie howling for another 30 seconds or so, but the sound diminished as they moved farther away, and I didn’t see any movement. I’ve viewed coyotes here on the mountain in past years, a loner trotting across the road, for instance, but I’d never seen them in a pack. It’s quite a startling experience to hear several vocalizing in your backyard. 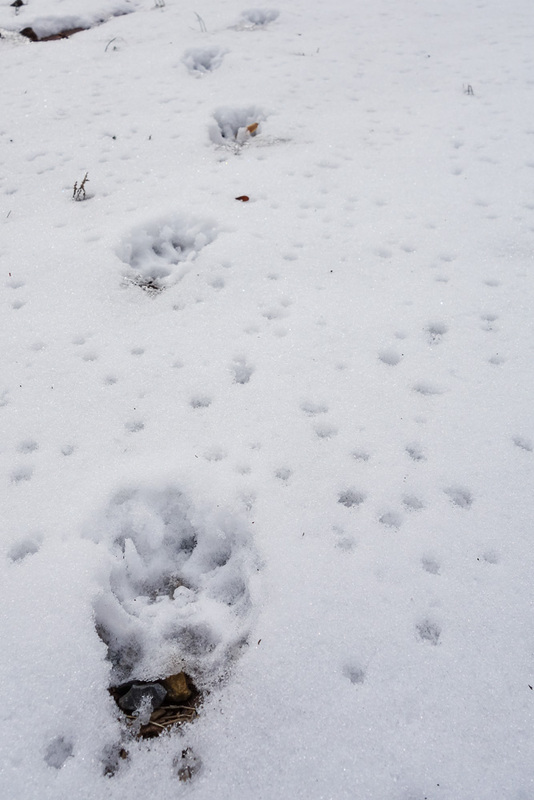 This morning when I went out to get the newspaper, I found their tracks crossing the driveway. Their presence will certainly make me think twice about letting Peppermint out in the middle of the night without supervision, because you never know who could be lurking in those shadows. Great capture in snow, but the track is a little to close for comfort. Coyotes like small cats and dogs. They are a big problem in W.V. also. Oh that is so sad. I’m glad that I heard them, otherwise I wouldn’t even think twice about letting Peppermint outside to roam the yard. Now I’m going out with her just in case. That would be a startling wake up call. We occasionally see them when we are hiking, once on top of a mountain. They have just been individuals though not a pack. Yes, I was definitely wide awake quickly! Would be a great alarm app for the iPhone! Wow, that is crazy. Exciting but yet a bit scary. I’d worry about my little critters too getting snapped up in the middle of the night. Their foot tracks are BIG ! What an experience! Was Peppermint upset by the howling? Yes, Peppermint leaped up as fast as I did. Interestingly, she didn’t growl or bark but just listened intently. It took us both a while to fall back asleep.